June 19, 2014 DOHA (Reuters) – Islamist scholars led by influential Qatar-based cleric Youssef al-Qaradawi urged Arab and Islamic states on Thursday to protect Sunni Muslims in Iraq, where sectarian war threatens after Sunni Islamist insurgents overran much of the country”’s north. “Sunnis have suffered a great injustice and severe exclusion, so it is natural to make a popular revolution against injustices,” the International Union of Muslim Scholars said in a statement issued from Doha in Qatar. Qaradawi is one of the Muslim world’s pre-eminent preachers and maintains close links to the Muslim Brotherhood, which was overthrown and banned in a military takeover in Egypt last year. Qatar’s backing of the Brotherhood and shelter for Qaradawi has stoked tension with other Gulf monarchies, who oppose them. But his group echoed recent statements by Gulf states condemning ISIL by rejecting “terrorist” groups it said violate Muslim principles. “There’s a need for unity for all honorable Iraqis, and a need for them to stand against the danger of sectarian strife and work to stop fighting and start reconciliation,” the union of Muslim scholars added in their statement. The GMBDW reported last week that Qaradawi had told a news conference that dialogue was the only means for solving the crisis in Iraq. 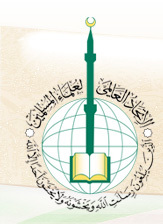 The International Union of Muslim Scholars (IUMS) was launched on July 11, 2004 in conjunction with a visit by Global Muslim Brotherhood leader Youssef Qaradawi to London for a meeting of the European Council for Fatwa and Research. Qaradawi is the IUMS President while many prominent individuals tied to the Global Muslim Brotherhood and/or Hamas have served as IUMS Trustees . For more information on the IUMS, go here.